The installations team at Sheerwater Glass recently undertook a bi-folding door project for one of our customers. The customer originally had white, uPVC french doors, but had always longed for bi-folds. Our installations team fitted two sets of bi-folding aluminium, anthracite grey doors. 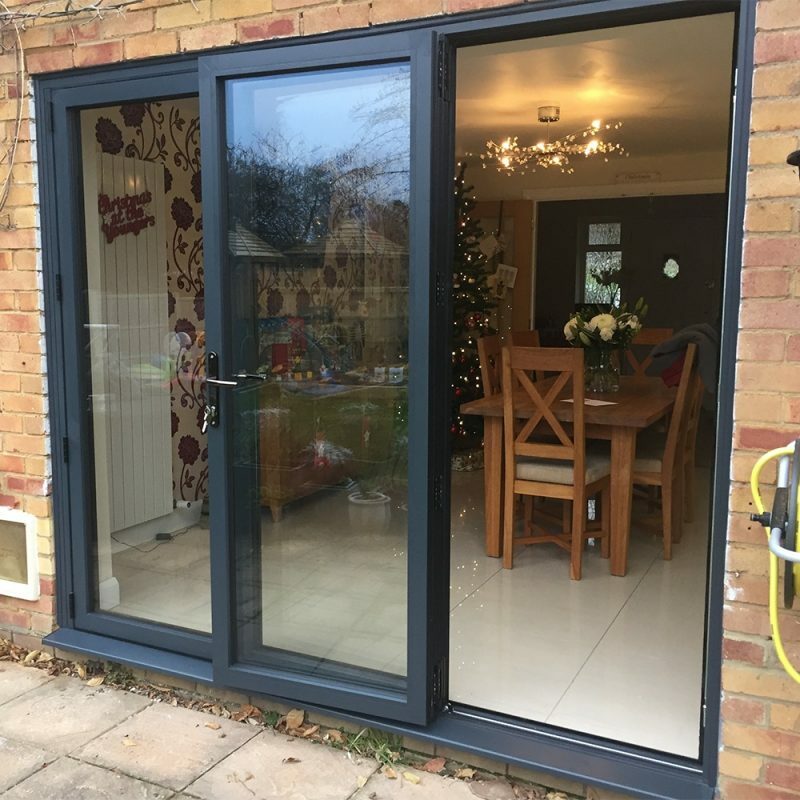 Once the customer’s grey bi-folding doors were fitted to a high specification, the customer updated and decorated their lounge, as well as started the process of improving their garden. The brand new bi-folds compliment the customer’s home brilliantly. Requiring regular easy-access to their garden meant that bi-folding doors were a great option for this busy family home. Our customer achieved a new space which is ideal for entertaining, just in time for Christmas! They can now enjoy their contemporary family space with stunning views of their garden. 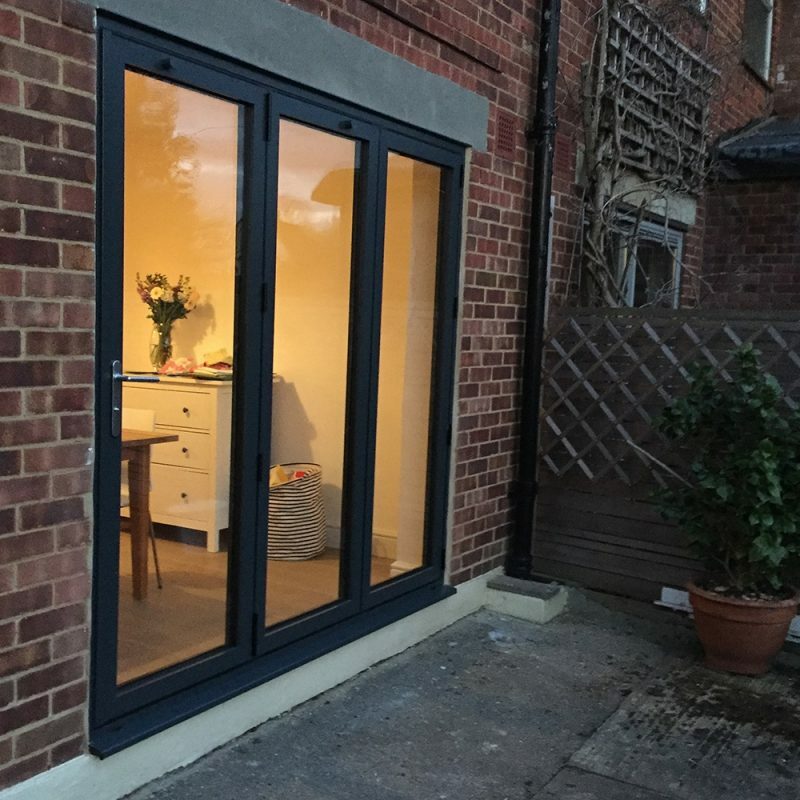 The homeowner was delighted with the final product, explaining that their new bi-folding doors look like they’ve always been there and are perfectly suited to their living space! Bi-folding doors are an excellent way to break the divide between your house and your garden. Bi-folding door panels fold in almost completely flat against each other and are effortlessly pushed to one side. This allows you to maximise the opening area of your room, providing easy access to your outside space. With over 20 different folding combinations, our bi-folding doors can cover widths of almost any size and create an opening space as large as you require. How your bespoke bi-folding doors fold is entirely up to you. We can even achieve bi-folding doors that wrap around corners of your house creating an outstanding view from both inside and outside your home. For more information about bi-folding doors, including grey bi-folding doors, visit our aluminium bi-folding doors page. If you would like help, or have any queries, please get in touch with our showroom today on 01932 344 415.